Darragh MacAnthony has come up with another offer to help fans. 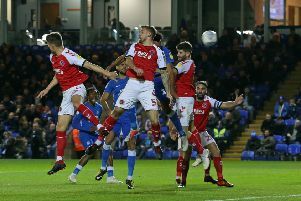 Following on from the excellent ‘football for a tenner’ offer for the Good Friday meeting with Fleetwood Town, chairman Darragh MacAnthony has announced that for 24 hours only, supporters will be able to take advantage of an Easter ‘Early Bunny’ offer, which will allow fans to pay a deposit on their season ticket and pay the rest at the end of the month. The club conducted a survey following the initial deadline on the discount period on season tickets for the 2017-2018 campaign and from the results, it was evident that some fans struggle to complete the purchase due to financial constraints. Therefore from 11pm tonight (Thursday April 13) until 11.59pm on Good Friday, fans will be able to put down a 10% deposit on a season ticket for the new season at the early bird discount rate and pay the remainder by the end of April. Season tickets can be purchased online at www.theposhtickets.com and from 9am on Good Friday at the ABAX Stadium Box Office. You can also take advantage of this offer over the phone by calling the Posh Ticket Office direct on 01733 865674 (option 2). The ticket office is open until 7.30pm on Good Friday.